Leo cut his hair, I did not cut the hanger string from my cardigan. Fail. I realise I purse my lips a lot…apologies for the irritating habit. These videos are not filmed to be ‘perfect’ I have no idea what we are going to talk about beforehand and between work and mummy hood I haven’t the time to make an epic Blue peter (is that still on?) narrative style video…so todays voices are all kind of my same high ‘only-for-dolphins’ pitch.. James Cordon rocks the voice in the film…I had no chance! BUT what I have seen in a short time is Leo’s confidence develop, he usually struggles with the focus for sitting down to read but when we are filming he does and he enjoys it. As much as this vlog is about our love of books it is also about capturing the pure delight and magic that is our children. For a vlog I think technically 13mins is a little lengthy; for a story though, time is put in a box and sat on. 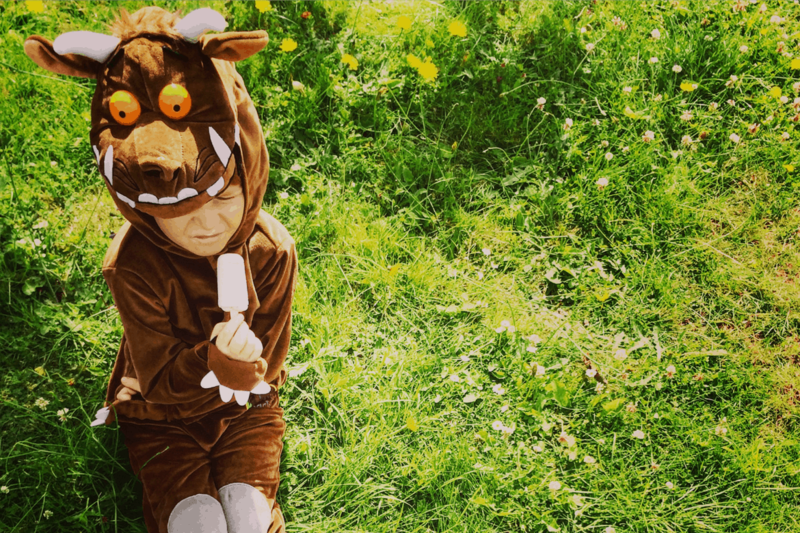 Leo picked the Gruffalo because he wanted to wear his outfit…I agreed because it is such a classic, magical book. I am all for a rhythmic rhyming scheme and made up creature. It is a story full of beans, just like my son, perfect I think for 3-5 year olds… Julia Donaldson is the outrageously talented author, we also have room on a broom and the smartest giant in town. I love this book because it is all about celebrating cleverness; a mouse encounters a host of animals that would quite like to gobble him up but he saves himself by making up a story about a beastie that ends up not being imaginary after all. It is to Leo what We are going on a bear hunt is to me. The bright illustrations bring the characters to life. For littles under 3 it is longer than the base level picture book but if needs be read it a few pages at a time! Maybe in the day rather than just before sleepytime…just to make sure no one gets a little scared. The Gruffalo website has songs and activities, it is a book perfect for encouraging creativity and imagination, you and your kids can draw your own made up monsters! You can talk with little ones about telling lies, being scared, about forests and where they may see animals like in the story. Ask; what is bravery? What would animals say if they could talk to us? Encourage children to make predictions after each page…what might happen next? See if older children can recall what types of food mouse said the Gruffalo liked. We love the gruffalo here too! We love all the Donaldson books they’re so amazing!